The award show featured performances from Usher, Jazmine Sullivan, Ledisi, and Toni Braxton. #Repost from @wwpublicrelations #BETHonors tonight! Thank you @BET!!! The BET Honors, which were held on March 5th and aired tonight, honored singer Patti Labelle and record executive and songwriter L.A. Reid for their achievements. Reid took home the "Business of Entertainment" award and Labelle won the "Musical Arts" award. Former Attorney General Eric Holder, filmmaker Lee Daniels, and financier Mellody Hobson were also honored. 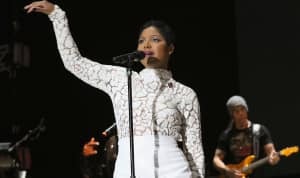 Musical performers included Toni Braxton, Usher, Jazmine Sullivan, and Babyface. The show was hosted by Arsenio Hall. Watch Usher perform and Patti Labelle accept her award below and find more videos of performance and acceptance speeches on the BET site.